My friend Simon wanted me to chime in and tell a story involving people and bears. Given that she is probably the only person reading, I thought I’d better comply. This is the picture in question. It’s now my user pic in several places because it’s just brilliant. You have to know one thing about me before I tell this story. I have two things that I am incredibly afraid of: guns and bears. When I started looking up information about Aialik Bay, I kept reading phrases like this: “All food and drinks must be kept secured in the cabin at all times. Black and brown bears frequent this area.” That wouldn’t be nearly so frightening if there was more civilization, but as I’ve said before, the human population in Aialik Bay is sparse at best. I had been intellectually gearing up for this for several weeks before leaving. I bought a bear bell and we picked up some bear spray in Anchorage. However before leaving for the wilderness, I had several test runs. Ben’s co-worker (and our neighbor) Scott and Scott’s fiance Tricia were also in town for the conference. On Saturday, Scott and Ben headed to the conference while Tricia and I headed to have breakfast with friends of mine and then explore the zoo. The Alaska zoo is pretty cool (more on that some other time). 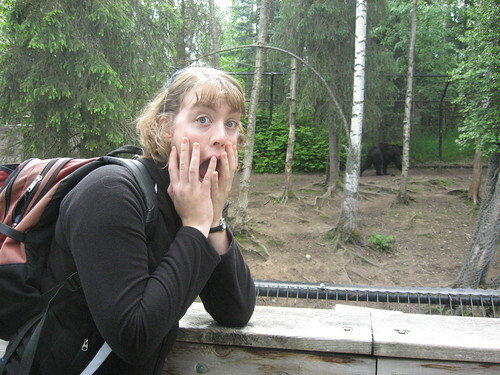 Standing around by the black bears, I thought it would be great to get a fake terror shot. Me facing the bears, very scared. So we took some shots. The photo above was the best of the bunch, although an earlier try is below. (The bear is so small though, it’s just not as impressive.) It’s just as well we did this with the black bears as the brown bears were all asleep. So that was my first interaction with the bears. This was the trail head. Opposite this was the bulletin board with all sorts of notices, most of which involved bears. But Tricia had her bear spray holster and there were four of us and we didn’t see any bears. Then we went on a hike to Exit Glacier, without our bear spray or bell, but with plenty of other moving pieces of food with us on the trail. We made it out just fine. I was at peace about bears when we stepped on the boat in Seward. Then the captain started telling us about all the black bears that were always around Aialik Bay and near our cabin. I began tensing up. He proceeded to tel us about a friend of his, who, a week earlier, had been mauled by a brown bear in Seward. (The friend survived.) Then he dropped the subject and we picked up some kayakers from the cove next to ours. They’d had a black bear cub poking around their camp the previous night for 30 minutes. I went tense again. Then we got to our cabin and we were alone, supposedly, with the bears. For the first few hours, I was tense, but then I realized that the chance of me being mauled while walking to the outhouse was slim, especially armed with bear bell and pepper spray. The ranger came by that evening and informed us that there were “lots of black bears in the area.” Again, my nervousness returned. No signs of bears the first day. The second day (the gray day, described below) I went out on a walk on my own and then decided that the seal in the middle of the bay was, in fact, a bear and it was going to come get me, so I went back inside and read my book. By day three I was a little mad at the bears. I’d showed up, we’d bought bear gear galore, I’d mentally prepared and now there weren’t any bears? Seriously? That wasn’t fair. I decided that I wanted to see a bear with the following stipulations. I wanted to be in the kayak, I wanted to be far away from the bear, and I wanted the bear to be in another cove. (I had forgotten that if a bear had wanted to enter our cabin, it definitely could have. But alas, no bear. So I had gotten all intellectually prepared and physically prepared and we never even saw a bear in the wild. 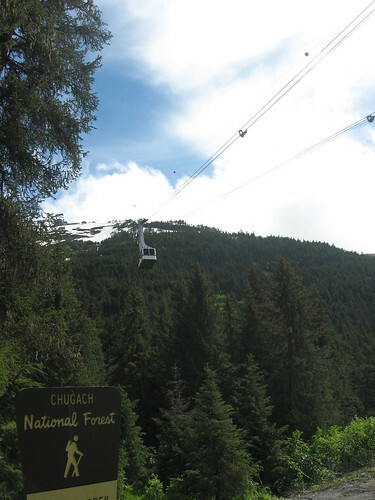 (We did see a wild moose and humpback and orca whales…) That is my anticlimatic story of bears in Alaska. As a special preview, I’ll let you know that tomorrow, also by Simon’s request, I’ll talk a bit about Mount Marathon and the annual fourth of July run.